For the sake of setting the record straight, let’s address a few of the most glaring holes in the arguments against environmental groups and international funding. If we’re talking about foreign dollars influencing Canada’s economy and politics, we can’t just focus on philanthropic funding for environmental charities and nonprofits. The amount of international money supporting environmental campaigns is vastly outweighed by the foreign funding that shapes Canadian policy and decision-making through corporate investment and fossil fuel industry lobbyists. The Canadian oil industry and other resource sector businesses have relied on huge amounts of foreign investment. Despite the fact that some international fossil fuel companies are now leaving the oil sands due to shifting markets, including low oil prices and the accelerating global shift to renewable energy, the oil and gas sector remains one of the top industries for foreign direct investment in Canada. In 2017, foreign direct investment in mining and oil and gas extraction was over $162 billion. Commentator Vivian Krause alleges that at least $40 million has been granted to 100 different organizations “involved in anti-pipeline activism.” First, it should be noted that this figure is cumulative of funding received by many different groups over the last decade, and only a portion of it was explicitly earmarked for campaigns focused on the tar sands. To give just one example, included in the Tides Foundation grants referenced by Ms. Krause was a grant our organization received for collaborative work with all levels of government to enable ecosystem-based (green infrastructure) responses to sea level rise, to provide flood protection for coastal communities. Second, this amount is a drop in the bucket compared to the billions spent by governments and industry proponents to promote oil and gas development. The Alberta government has spent $23 million in the past year alone on its aggressive ad campaign promoting the Trans Mountain pipeline (which our federal government purchased for $4.5 billion). Membership of the Canadian Association of Petroleum Producers, which registered 131 lobbying reports with the federal government in 2018, includes such foreign heavyweights as the Koch brothers and PetroChina. And let’s not forget that many of the projects environmental groups are concerned about are foreign-owned (or were, until federal buy-outs). Funding for environmental campaigns helps to correct the imbalance of power between ordinary citizens and the financial and political influence of multinational companies in Canada. Without it, Canadians might only be hearing one side of the story. Climate change crosses borders. Why shouldn’t our funding? At West Coast Environmental Law, we’re open about the sources of our funding. Our work is supported by a combination of individual donations, foundation grants and a small number of socially responsible corporate donors, from within Canada and internationally. Each year we provide a list of our foundation funders in our annual report. We are grateful for the contributions of all of our donors and supporters who, like us, recognize the need for collaborative solutions to protect the planet and our communities. Canadian environmental groups are doing critical work at a time of unprecedented challenges – challenges that do not stop at Canadian borders. Global issues like climate change, biodiversity loss and water protection need global solutions, and Canadian environmental organizations can and do play a key role. 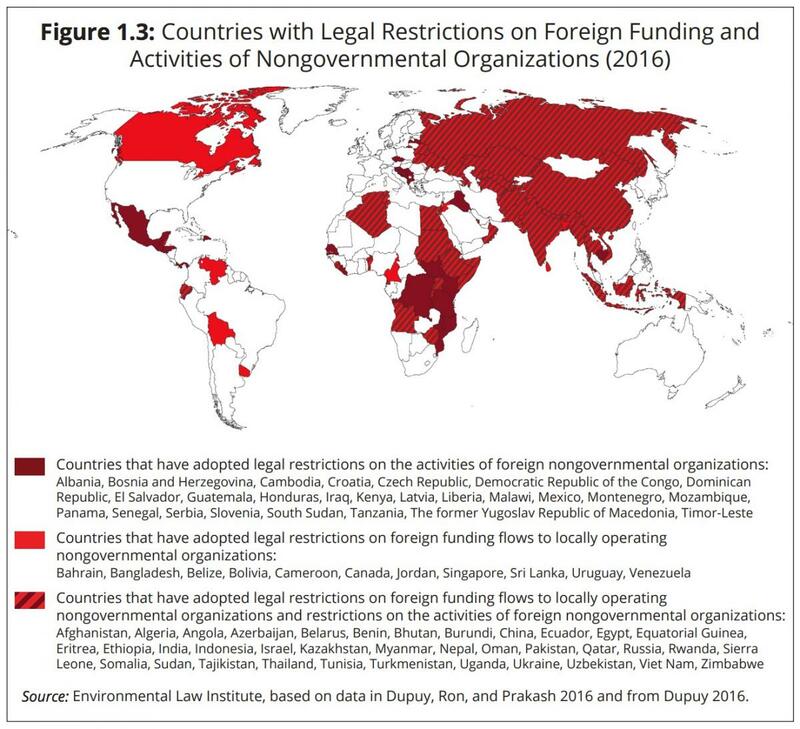 Unfortunately, progress in strengthening environmental laws and policies has led to a backlash over funding for the civil society groups that advocate for those policies, both in Canada and around the world. Map from UN Environment Programme report, "Environmental Rule of Law". These types of funding restrictions, such as the targeted CRA audits imposed under the last federal administration, have already been attempted in Canada. And some politicians are proposing further limitations on international funding for environmental nonprofits. It’s no secret that funders from outside of Canada are contributing to the work of Canadian environmental organizations. The real question is – so what? At this critical moment, international collaboration on environmental solutions is essential to address the urgent (and global) environmental challenges we face today. Since 1974, West Coast Environmental Law has provided legal support and educational resources for individuals, First Nations and community groups, to ensure that their voices are heard on the environmental issues that affect them. We continue to press for stronger legal safeguards for the environment, and more democratic processes that allow people to participate meaningfully in decisions about resource development. And we stand with Indigenous nations that have exercised their inherent jurisdiction to deny consent for oil and gas expansion proposals in their territories under their own laws. This is not the first time our motives and funding sources have been questioned. In 2012 – when people across the country were speaking out about risky pipeline proposals and the weakening of federal environmental laws – West Coast and other environmental groups were targeted by similar misinformation campaigns. Claims that US-funded environmental campaigns are aimed at “bullying Canada out of the market” to benefit the American oil industry are just as bogus now as they were in 2012. Even industry proponents have chimed inabout the dangers of believing this conspiracy theory. Canadian climate campaigns have focused primarily on Canadian policy, and for good reason. This is where we live, and the decisions made here affect our lives and our future. But that doesn’t mean we aren’t paying attention to environmental threats and big polluters outside our borders. For example, our Climate Law in our Hands initiative seeks accountability from 20 major fossil fuel producers around the world that have contributed most to the climate crisis – such as Exxon, BP and Saudi Aramco. Funders all over the world recognize the hard work that’s required in Canada in order to confront climate change, protect land and water resources and transition to a healthier global economy. So do the Indigenous leaders standing up against fossil fuel expansion, as well as the thousands of Canadians who continue to sign petitions, attend rallies and support environmental campaigns. Together, we represent a legitimate Canadian perspective that is critical to sound policy-making, especially in the face of influential corporate lobbyists. Diversionary tactics like the current attacks on sources of environmental groups’ funding only sows division, undermining our democracy and the core Canadian value of civil discourse. Scapegoating environmental groups and our funders will not solve anyone’s problems. Right now what we need is cooperation – across borders, partisan lines and different sectors of society – to address the challenges that threaten the health of our environment and future generations. Top image: (left) Kris Krug/Creative Commons, (right) Stock photo.